Ganesha Statue is the Lord of success and destroyer of evils and obstacles. 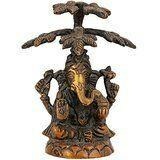 Ganesha Statue is known to Bring prosperity and happiness in your home & Office. He is also worshipped as the god of education, knowledge, wisdom and wealth.Size : 4 Inches Height X 2 Inches wide X 3 Inches depth. Weight : 300 Grams Material : Brass.Deepen your worship or add distinction to your decor with a genuine handmade Indian statue unlike anything you've seen before. Order the Handmade Indian Brass Idol today.